March Town heroes Toby Nulty and Nathan Oliver. Wisbech and Nassington are heading in opposite directions in Cambs Division One. 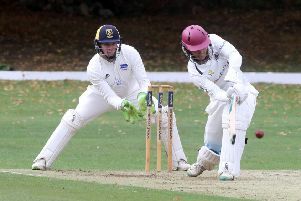 It’s three wins in a row for the Fenman under new captain Sam Rippington and four defeats in succession for Nassington after the teams met at Harecroft Road today (July 23). Gary Freear cracked a ton for Wisbech against Nassington. Nassington felt they’d made a competitive score when reaching 192 all out, but on a perfect day for batting Wisbech raced to victory with nine wickets and numerous overs to spare. Gary Freear continued his rich vein of recent form by finishing unbeaten on 100, while Aussie Jack Hargreaves was undefeated on 71 at the close. The pair added 184 for thwe second wicket with Freear facing just 109 balls and striking 13 fours and a six and Hargreaves stroking 12 fours. That rather spoilt a terrific 84 from Nassington’s Aussie Adam McDermott, an innings that included three big sixes. Pete Rowe had a fine all-round game for Ketton at Burwell. Brodie Ellis (4-24) and Rippington (3-17) bowled well for Wisbech with the Bandaranaike brothers Alex (41) and Dan (30) offering McDermott most support with the bat. Ramsey’s title hopes suffered a knock with a 144-run defeat at Histon after the home side piled up 302=7 in their 50 overs. But Ketton kept themselves out of danger at the other end of the table with a six-wicket win at relegation rivals Burwell seconds. Antipodean Pete Rowe was the all-round star for Ketton following 2-35 with the ball with 62 not out as they chased down Burwell’s 205-9. Zeeshan Manzoor 52, Matt Milner (2-22), Ulrich Van Duyker (2-27) and Ross (32no) also performed well. Last weekend (July 16) March Town smacked a club Cambs League record of 332-8 in Division Two and they followed it up with 272-7 in 50 overs against Ufford Park. This was in many ways a more commendable effort as March were struggling at 89-5 before a sixth-wicket stand of 159 between Toby Nulty (103) and Nathan Oliver (73no). It was Nulty’s first Cambs League ton and a first Saturday senior half century for Oliver. Ufford didn’t help themselves by dropping eight catches including Nulty before he’d scored 10. Newborough’s slide down the table continued with a nine-wicket defeat at home to Granta. When asked for individual highlights, skipper Ali Greenwood said ‘there were none’. Newborough are now in the drop zone in a season when three teams are relegated. Burwell 205-9 (M. Milner 2-22, U. Van Duyker 2-27, P. Rowe 2-35). Ketton 206-4 (P. Rowe 62no, Z. Manzoor 52). Nassington 192 (A. McDermott 84, A. Bandaranaike 41, D. Bandaranaike 30. B. Ellis 4-24, S. Rippington 3-17). Wisbech 193-1 (G. Freear 100no, J. Hargreaves 71no). March 272-7 (T. Nulty 103, N. Oliver 73no, T. Howgego 24, T. Hussain 2-25). Ufford Park 158 (R. Keymer 37, W. Dallas 30, T. Phillips 4-25, A. Wright 2-38, A. Palmer 2-40). Newborough 116 (A. Weston 22, S. McCracken 21, D. Herath 4-36). Granta 120-1 (S. Abassi 42, T. McKibbin 37no).